As the two teams came out to Van Halen’s Jump, there was much talk of the Big Three in France setting themselves apart from the rest of the league even this early on. Nevertheless, even within that subdivision, there’s a distinct line between Marseille, and Paris Saint-Germain and Monaco. Marseille may have finished second last season, but they, like so many runners-up around Europe, were some way off leaders PSG, and, despite playing at home, they appeared to be heading into the game to stop PSG from winning rather than going for it themselves. The two teams were set up to match one another perfectly: Marseille in a 4-2-3-1 and PSG in a 4-3-3, ensuring each player had an opposite number and only Zlatan Ibrahimovic, who would drop off the front between the lines, found any space. This unfortunately led to a rather dull opening half an hour, with the few chances coming from lapses in concentration rather than well-worked play. Elie Baup’s men had an obvious split between their team, with the front four the only ones really involved in attack and everyone retreating into two banks of four when defending. The split in Laurent Blanc’s side appeared less intentional. 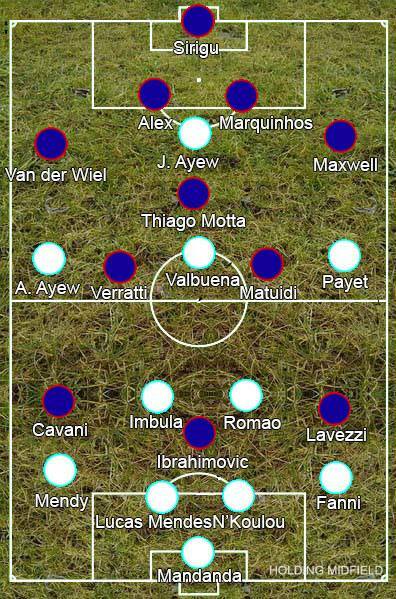 Thiago Motta would drop back into the defence to allow Maxwell and Gregory van der Wiel to get forward, but Marco Verrati and Blaise Matuidi would also drop very close next to them to come and pick up the ball, meaning those five would be clustered together and the full-backs and forwards would all be in a line at the other end of the pitch. PSG were having more luck passing it into the feet of Ibrahimovic to flick wide first time than Marseille were, relying on Mathieu Valbuena, closely watched by Motta, for their creative spark, but neither were really having much luck. This changed when Motta, thinking he had plenty of time, attempted to control the ball in his own area. Valbuena pounced on the loose ball, earning himself a kick from the startled Motta and a penalty for his team. Motta was harshly sent off to give Marseille a man advantage and the resulting penalty gave them the lead. Ezequiel Lavezzi was removed so that Adrien Rabiot could help shore up the midfield, switching to a 4-4-1 with Edinson Cavani moving a touch deeper. The need to regroup at half-time was lessened when they got an equaliser just before half-time in one of the few significant tactical features: Ibrahimovic getting a bit of space and hitting it wide for Van der Wiel to cross, Maxwell heading home when Steve Mandanda couldn’t get near it. In the second half, PSG looked to take back the attacking impetus despite their man disadvantage, moving Cavani back up alongside Ibrahimovic to make a 4-3-2. It worked, as Marseille appeared to be struggling more than ever – the long raking cross-field balls that should have been stretching PSG’s undermanned team no longer finding their targets as they were in the first half. Just as Marseille seemed to regaining their footing, Dimitri Payet testing Salvatore Sirigu with a well-struck shot, Andre Ayew gave away a cheap penalty which Ibrahimovic duly slotted into the net. From having a secure lead, Marseille were now facing an embarrassing defeat. Attacking no longer needed, Ibrahimovic was substituted for defender Zoumana Camara as PSG shut up shop, making a 5-3-1. With PSG happy to play defence against Marseille’s attack, the home side couldn’t muster up anything other than one or two half-chances. Even with a man advantage and a equaliser to chase, they were unwilling to get their defenders forward. To some extent the result was indicative of the gap between Marseille and the bigger two, as they had to rely pretty much exclusively on the brilliance of Valbuena for their creativity while PSG could bring on better players than the host’s first teamers from the bench, but it was a pretty pathetic performance from Marseille regardless.